Last chance! This book is out-of-print and we don't have many copies left. Get it while you can! Matt Tavares s luminous illustrations and Stephen Mitchell s wry text transform this classic Grimms fairy tale into a splendid edition to treasure. "Deep in a forsaken wood, a wild man keeps watch over a golden spring." 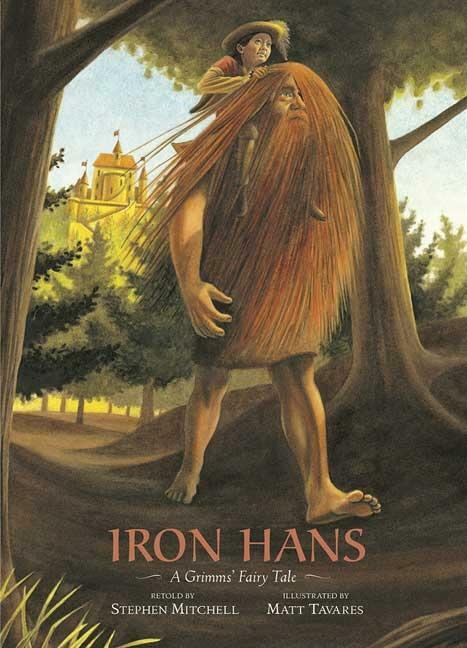 Iron Hans is nine feet tall and as brown as rust, with hair to his knees. He is cursed, a terror to all, until a young prince finds the courage to befriend him. But when the boy betrays Iron Hans s trust, he must make his way in the world alone, penniless and unknown save for a little help from a certain forgiving wild man. Stephen Mitchell s deft retelling and Matt Tavares s elegant illustrations gracefully render this timeless Grimms tale about pride and humility, wealth and poverty, and the importance of doing good, whether servant or prince, wild man or king."